Home » Planetary Round-Up » The Stars This Week + No Cheerleading + ARE YOU DEPLETED? The Stars This Week + No Cheerleading + ARE YOU DEPLETED? I was working on a reading today for someone, an email reading, and I had in mind that I was going to go overtime. I wanted to. It felt right. Sometimes I do that. Have to finish a job. That’s how it feels. I don’t mean that in a cold way, but don’t stop until the job feels done. And then just now a gal I’ve worked with quite a bit over the years messaged me to give me some news, some good news (I think). And then… hmm… and then I noticed something quite peculiar 🙂 something I don’t think I experience all that often because in this work that I do, this life of mine, I give a lot of energy. And there she was. Not officially giving me a reading per se — but she was giving me energy. It felt good. I went to the other room for some kitchen experiences, and that’s when it dawned on me. I don’t mean to make this sound sad but… it did feel remarkable. Not sad but remarkable. To be open to the experience of receiving. And it was just enough. The right amount. So we are in between Eclipses and as I’ve noted elsewhere, we’re under particularly good transits for these in between days, lots of sextiles. This coming week for example: Venus will sextile Jupiter, the Sun will sextile Mars, Mercury (retrograde) will also sextile Mars. It’s the Libra cluster making nice with Leo and Sagittarius (fire trine). You can relax. Notice anything about Mercury retrograde so far? Mercury went back into Libra on Friday so yes the spirit of DO-OVER in relationships and other Libra issues (and the issues of your Libra house) are flirting with you. Are you treating others fairly? And vice versa? How important is this to you? And when was your last good kiss. Dare I quote Richard Hugo? Yes. Yes I do. Your homework: Write a poem. Your other homework: I want you to think about the energy exchanges in your life. When was your Last Good Kiss. i’m feeling kind of mellow this evening. We had a lovely walk (and jog) in the park. I got no drama or tzuris for you. No cheerleading. But let’s draw a card for the retrograde from my new deck 🙂 Well HELLO. 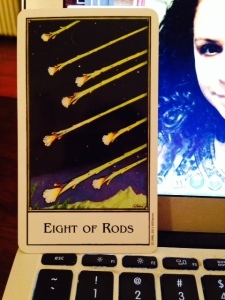 Eight of Rods (Wands). News travels fast? What is this news, pray tell? I think it was the amazing Rachel Pollack who talks about this being the ONLY card in the whole deck without a figure of any kind in it, not even a part of one. Even in the Aces, we see hands. In the Moon, we have animals. The Rods look like shooting stars to me, across the heavens. The Rods look less like Wands and more like branches, shoots of life, big buds at their tips. Where are they going? What do they have to say? The Stars Today! Sun! Mercury! Other Stuff! Really like your description of the rods, reminds me of the ending stanza in the poem ” I carry you heart”. Sounds like the foundations of love and a true relationship. When was the last time I had a good kiss? (That IS a good question!) Today, yesterday…the day before. There is much Venus energy around here. The idea is to spread it far and wide, like wings.